For green onion layer, place 8 oz (250 g) of the cream cheese, 1/4 cup (50 mL) of the green olives, green onions, 2 tbsp (30 mL) of the cilantro, one garlic clove and salt in Classic Batter Bowl; mix well. For tapenade, combine remaining green olives, remaining cilantro, remaining garlic clove and 1/4 cup (50 mL) of the ripe olives in (2-cup/500-mL) Prep Bowl; mix well. 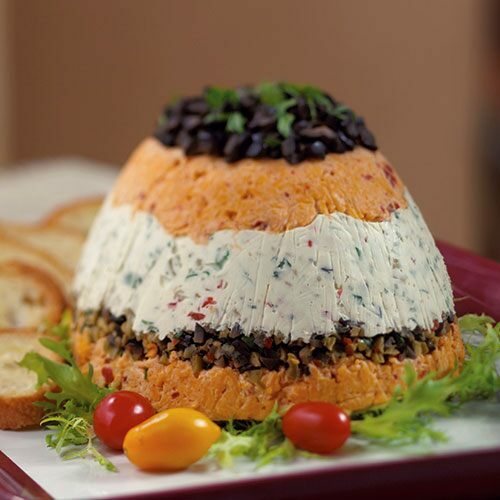 For cheddar layer, combine remaining cream cheese, cheddar cheese, sour cream, chipotle pepper and adobo sauce in Stainless (2-qt./2-L) Mixing Bowl; mix well. Line Small Batter Bowl with plastic wrap; spread evenly with 1/2 cup (125 mL) of the cheddar layer. Top with green onion layer, spreading evenly. Top with tapenade. Spread remaining cheddar mixture over tapenade. Cover and chill about 2 hours or until firm. Invert torta onto serving platter. Remove plastic wrap. Top torta with remaining ripe olives and additional cilantro, if desired. Serve with baguette slices, if desired.